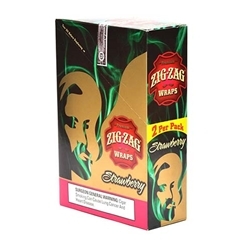 Style: Zig-Zag Premium Cigar Wrap - Strawberry, utilizes a distinct flavor application system combining the finest Dominican, Nicaraguan and Honduran tobaccos to create a perfect blend of flavorful cigarillos that are unprecedented in the market place. Zig Zag Premium Blunt Wraps come in a foil pouch that is resealable for freshness. Each foil pouch contains 2 wraps.